Honda Cars India senior VP of sales and marketing, Mr. Jnaneswar Sen has revealed in an interaction with media that Honda Amaze Diesel, the upcoming compact sedan from Honda based on the Honda Brio small car, will be priced aggressively. One of the key reasons why Honda Cars India is able to keep the prices under check is the amount of localization which is planned for the Amaze in India. In its previous experience with car sales in India, Honda has tried and tested this approach with its popular cars like Brio and City. With increase in localization of the components, the production costs reduces which helps to price the cars more competitively and they do better in terms of sales numbers. Honda is well known for its refined engines and quality of materials used in its cars. The fit, finish and build quality of Honda cars in India give them an edge over the competitions. With its man maximum and machine minimum design strategy, Honda had created Amaze Diesel with good amount of Interiors space besides compact exteriors with a sub-4 meter overall length. Also the driving dynamics of Honda Amaze Diesel are quite impressive because of a well sorted suspension. 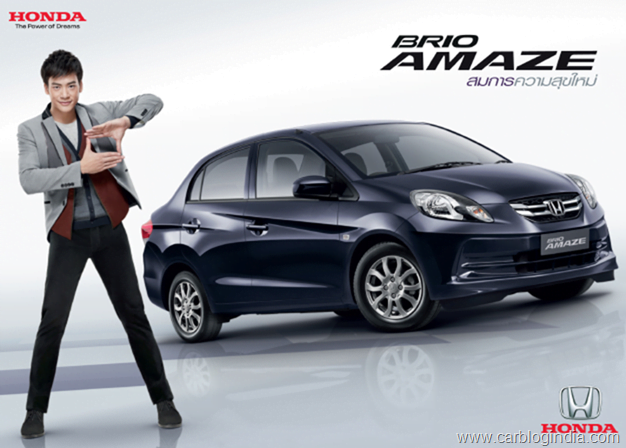 The diesel engines for the Brio Amaze will be manufactured at the Rajasthan plant of Honda Cars India which will start producing 1.5 Litre i-DTEC Diesel engines in 2013 which will power the Amaze sedan. With most of the components for the engine locally sourced and minimization in imports, Honda Cars India will be able to offer low costs along with lesser dependency on the other plants of Honda and foreign suppliers. Since the main competition of the Amaze will be the segment leader Maruti Swift Dzire which is sold a an ex-showroom Delhi price of Rs. 4.91 Lakhs and Rs. 5.99 Lakhs for petrol and diesel base models respectively, we can expect the Amaze petrol with a 1.2 Litre i-VTEC engine to be priced between Rs. 4.80 Lakhs to Rs. 5 lakhs Lakhs and the Honda Amaze Diesel’s price between Rs. 5.80 Lakhs to Rs. 6.10 Lakhs for the base model. For even better economies of scale, Honda Cars India will also utilize the same engine (maybe with different tuning or different turbocharger) in Honda City Diesel and Honda Jazz Diesel which are planned for 2014. Honda has an aggressive plan of launching 8 new Honda cars by 2015 in India.